To prove our ability to support any customer request to meet existing handling needs there may be, for IHC, Carer developed an electric forklift truck with a capacity of 7t, super compact even if fitted with ultra elastic tyres and designed to ensure exceptional towing. Indeed, the model built for IHC can easily tow trailers on ultra elastic tyres up to 60 tons. Moreover, upon specific request from the customer, we designed a special device applied at the rear of the machine. 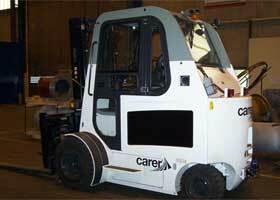 Via keyboard, it can drive the forklift truck until it reaches the hook of the trailer it needs to be coupled to. This is all done under 100% safe conditions for the operator and the working environment.